1. Lemon & Honey Lip Pack- This is a perfect mask to remove the tan from your lips. Mix equal amounts of honey and lemon juice into a bowl to make the tan-removing pack. The citrus extract of the lemon help to remove the tan, while honey adds color to the lips. Apply the honey-lemon pack on your lips and leave it for an hour. Wipe it off with wet cotton later. You can repeat this process many times a day to remove tan and pigmentation. You can refrigerate the pack and use it for a week. 2. Apply Glycerin Before Sleeping- Along with sun exposure, dry weather may also cause pigmented lips. Apply glycerin using a cotton bud on your lips before going to bed. It helps to retain moisture, prevents drying, and helps to get rid of dark lips naturally. 3. Stay Hydrated- Don't just depend on contemporary treatments for beautiful lips. Along with contemporary treatments one also needs to take care of their health. Drink 8 to 10 glasses of water every day to keep your body hydrated and prevent darkening from dehydration. 4. Apply Beetroot- Take a small slice of beetroot and simply massage it on your lips whenever you find time. This will help remove tan and add natural color to the lips, giving you the natural pink pout in a few days. 5. Check Your Lip Products- Check your lip products (lip liner, lipstick, gloss, balm) before applying. 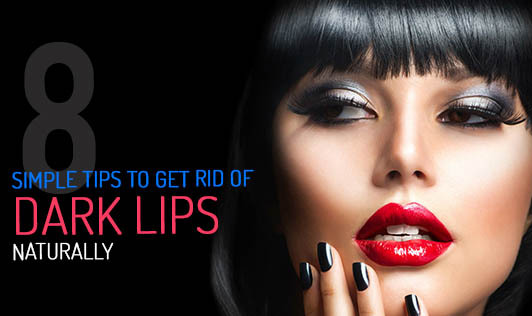 Cheap lip products may cause allergy and make your lips dark. Do not buy local brands or wholesale products for your lips. Always check for the expiry date while using a product and discard as soon as the product expires. 6. Fruit Therapy- Use fresh fruit purees as lip masks regularly to remove tan and pigmentation. 7. Almond Oil- This vitamin E rich oil helps to lighten lips and reduce discoloration. Apply the oil on your lips at bedtime before sleeping. 8. Cucumber Juice- Apply cucumber juice every day to lighten your lips.